Rotary Capping Machine, the AK0120 and the AK0240 are automatic rotary capping machinery for screw, press and ROPP cap sealing. 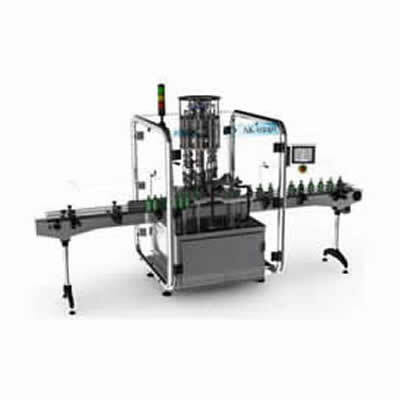 It has an output of around 120 bottles per minute with a maximum of 240 BPM under optimum conditions with smooth and accurate container handling, it has a 7.touchscreeneen capable of storing of up to 200 recipes programmable for different capping applications and for a range of capping chucks to suit all closure types. If you are unsure of the capping machine, but know the output that you would like to achieve, this chart gives estimated outputs to help you get an idea of the capping machine that fits your requirements. The output of the capping machines will vary depending on the type of cap Screw, ROPP, Press, or Trigger and the cap size.